So we got back from the lake safely. We had a very good weekend and I was able to do a fair amount of stitching and reading. I should have worked on my Redwork Exchange while I was there, but alas I did not. Instead, I started my Mirabilia Christmas Elf Fairy kit. To the left is how far I got. The pretty green scissor fob adorning the fabric is a birthday gift I received from Sue. Thank you so much Sue, it is lovely!! Since returning home, I have been drowning in a mire of inservices at work. I don’t think I can sit through another 8 hour conference in a middle school auditorium. 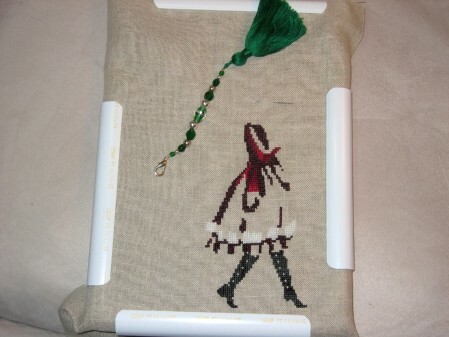 Last night I was a good girl and finished up the stitching on my Redwork Exchange. I know how I am going to finish it, but need to make a quick stop at the fabric shop on Friday afternoon. It will be ready to head out in the mail on Tuesday:) I am very excited about who I got to stitch for. I read her blog every day! Your welcome for the fob. I enjoy your blog a lot, as I’ve said before we have similar taste in what we like to stitch. I’ll be stitching Christmas Elf Fairy for one of my daughter’s for Christmas. Yours looks so cute. Looks like she’ll stitch up fast. She’s looking great so far Leslie – nice progress! You have a lovely blog! Thanks for bookmarking me! I have also bookmarked you so I can come back and visit! Your Xmas elf fairy is coming along very fast! How long have you stitched on her? She is looking lovely! Congratulations! I’m glad to hear you had a nice weekend. I love the Christmas fairy! You made a very good start on your Fairy! The fob from Sue is beautiful! Can’t wait to see your redwork. I’ve been working on the Elf fairy too, she’s so cute. Between yours and mine we’d have a complete fairy, well, almost, lol! You’ve made a nice start on your Christmas fairy. I’m looking forward to seeing your redwork exchange project. Wow, great progress! I love her so far! Your progress are great!!! Your elf fairy will getting lovely!! That fob is fabulous! And your Christmas Elf Fairy is coming along nicely.